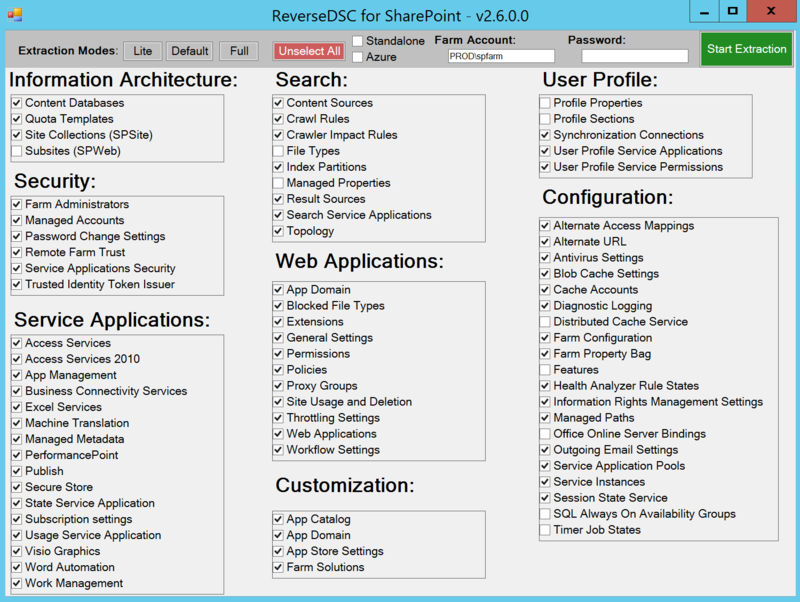 ReverseDSC for SharePoint is getting a User Interface! That’s right, you’ve read correctly, a GUI for the script based SharePointDSC.Reverse. This GUI is completely built using PowerShell (which is part of why it looks like its 1995 all over again), so all you need to do is download the script from GitHub (soon to be available on the gallery as well) at https://GitHub.Com/Microsoft/SharePointDSC.Reverse and also make sure you grab the latest version of the SharePointDSC Module, and you’re ready to roll. The new interface allows you to visually select the components you wish to include in your ReverseDSC extraction. The 3 mode buttons at the top will automatically select all the components associated with the selected extraction mode (see Extraction Modes for more details), and you will be able to provide the Farm Account Credentials right from the get go to speedup the script’s execution. Options to extract the DSC as a standalone configuration (merge multiple servers into a resulting standalone server config) and the option to extract a configuration that can automatically be pushed up to Azure Automation DSC are now exposed as checkboxes right in the top menu. For those old school IT Pros who just want to run the script as they used to, simply use the -Quiet switch when calling the .ps1 script to default back to the scripted only extraction. We have tons of additional features coming down the pipe, and we are always interested in getting your feedback on what we release. We hope you’ll enjoy this major update to the ReverseDSC for SharePoint Tool! Pretty impressive work. We are doing something similar and have created a GUI tool that is built on top of Reverse.DSC.Core. We are using it to convert System configuration information into Powershell DSC Scripts. Once we have created the Powershell DSC scripts we use them to automate the provisioning of dev/test environments. PreviousIT Pros Need to Get on the Software Development Lifecycle Right Now!